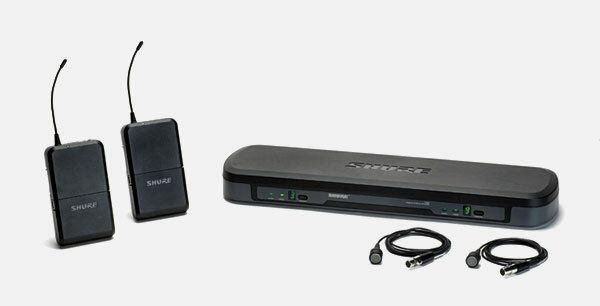 The Shure Performance Gear dual PG185 wireless system is the perfect introduction to their wireless portfolio. This package comprises two PG1 Bodypack transmitters, two PG185 lavalier mics and a PG88 diversity receiver. The Shure PG188/PG185 Performance Gear Dual Lavalier wireless system operates in the 2012 digital switchover compatible Channel 38 606-614MHz range. The Shure PG185 is a visually discreet electret condenser lavalier microphone suitable for spoken word and presentations. The compact and robust PG88 wireless dual receiver includes features such as internal antennas which minimise poor positioning and breakage, as well as being easier to store. You can choose from 10 selectable frequencies at the touch of a button, and up to four systems can be used together.